To look for the availability of a business entity in the database of the Colorado SOS, you need to have at least one of the following information handy. Alternatively you can also check for the availability of companies or entities in the state. 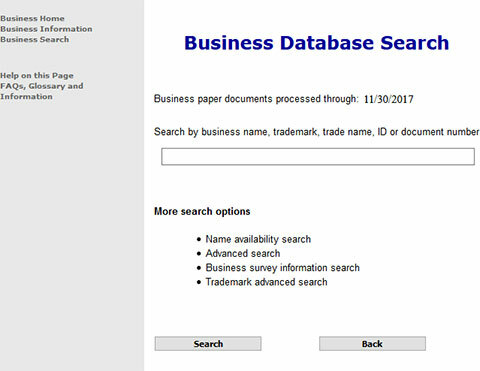 Below is a step by step guide in helping you search the Colorado business entity database for companies and corporations. Follow the steps listed below to check the availability and the details for business entities in Colorado. 1. To access the Colorado business search page, click here. The screenshot below shows you what the search page looks like. 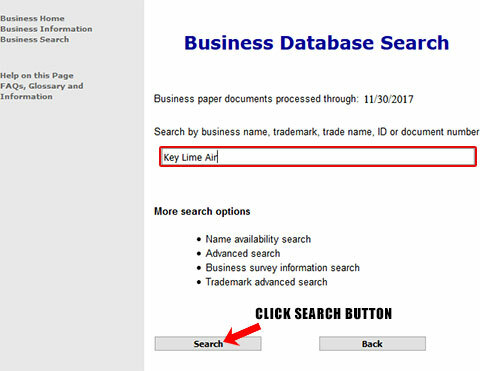 For the next step, type in a business name, for example "Key Lime Air", in the search field. You can click the links below the search field to search using other options. 2. Click on the Search button and the result page as in the screenshot below will follow up. 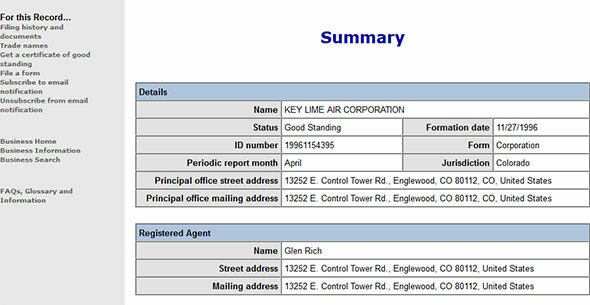 Here the results are for the business entity, "Key Lime Air". 3. Click on the ID number to get further details regarding the company or business entity. The business details listed in the screenshot below for the ID number 19961154395. This is the unique identification number assigned to this business entity at the time of filing. Information such as corporation status, formation date, entity number, registered agent etc will display on the business entity details page as shown below. With the click on the ID number, all details like Status, Formation Date, Entity number, Registered Agent etc. will appear. You can also opt for a more sorted search result by using the advanced search tool. Click on the Advance Search button and fill in the required details and click on search. 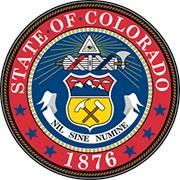 The Secretary of State of Colorado is one of the five elected constitutional offices of the State Government. The office is headed by Wayne W. Williams since January 2015 after the term of office ended for Scott Gessler.